My father taught me how to grill. He made the most delicious chicken. I asked him one day if he could teach me. It took him awhile to finally tell me: I think he had to devise some kind of recipe that I would be able to understand because I truly believe he made that chicken on feel alone. He would sit on the patio next to the grill with a drink, and turn that chicken frequently, taking off pieces as they became done. I can’t say that my chicken tastes exactly like his but it’s close. And learning to grill chicken gave me the basic knowledge to grill other foods as well. So to get everyone out there that hasn’t grilled before started, this is an introduction. I solely grill on a Weber Gas Grill, so all reference to grilling will be towards this particular grill. 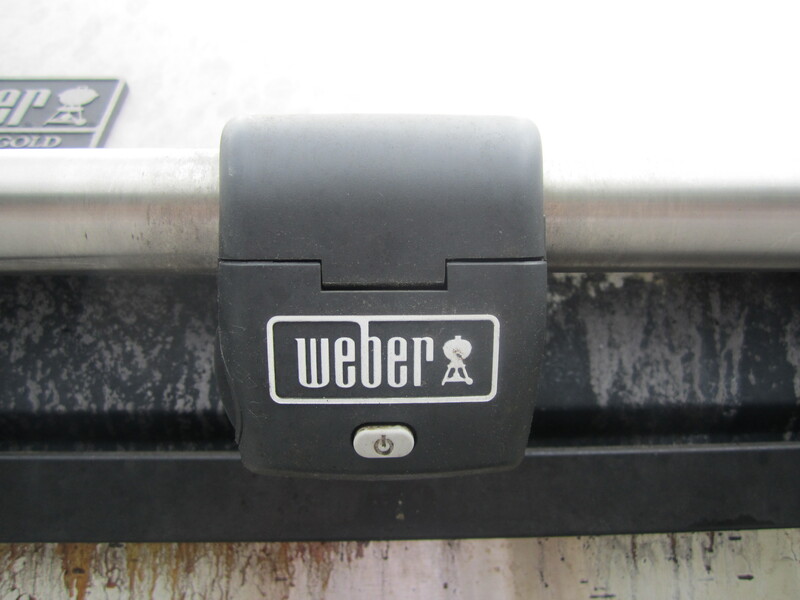 I like Weber grills. They are made in the U.S.A. so parts are readily available on-line and in stores. I also encourage you to read the manual that came with your grill and if this is unavailable, look for one on-line: Weber Grill Manuals. 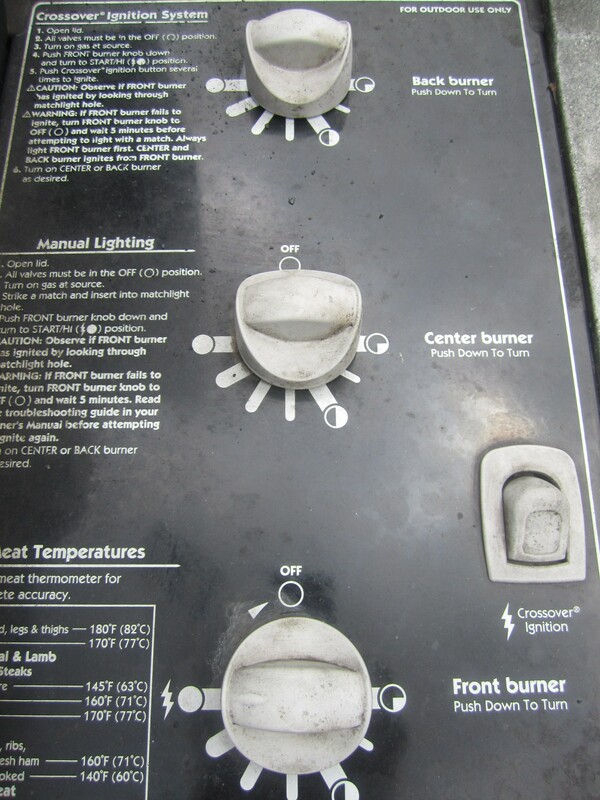 Open the hood of your grill and take off the cooking grate. (the grill is not on, right?) Then remove the bars. 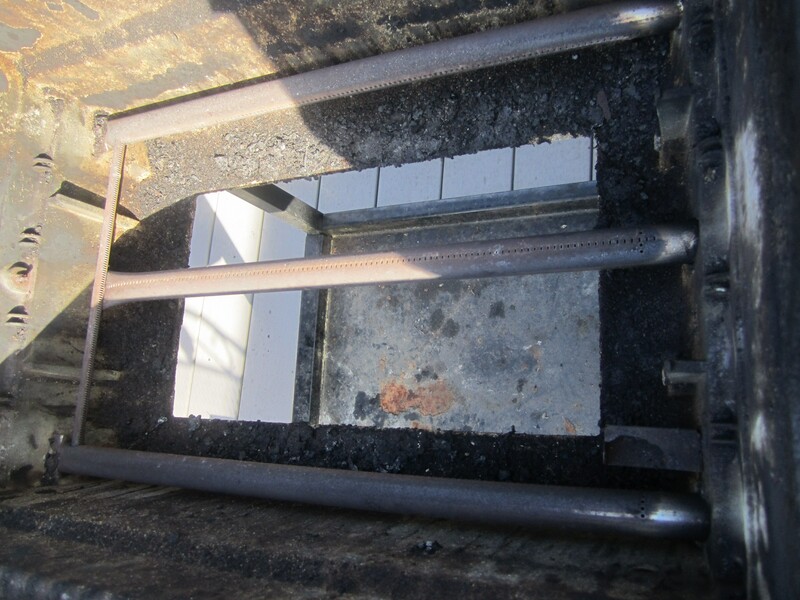 On the bottom is a little pan (drip pan to be precise) to catch the grease, remove that too. Set yourself up with a large plastic garbage bag inserted into a large garbage can. 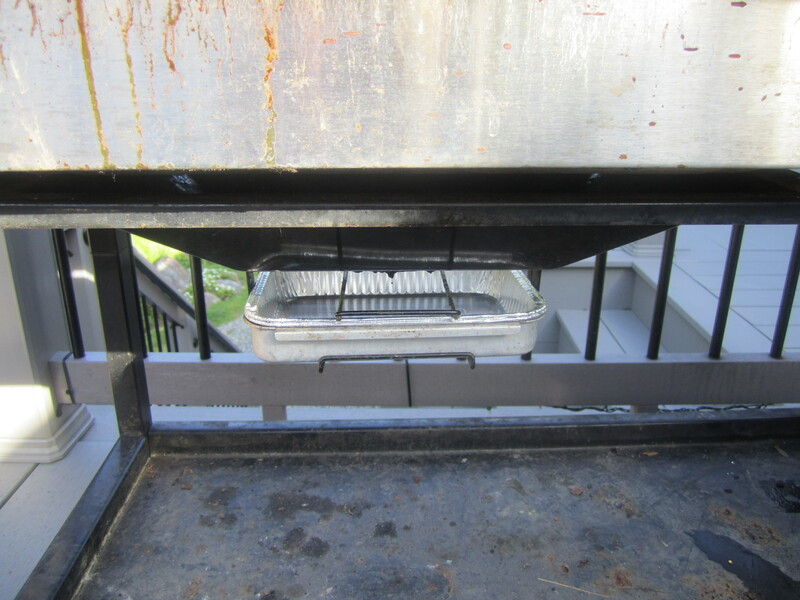 Remove the tray that is under the body of the grill and scrape all the residue from the tray into the garbage can. 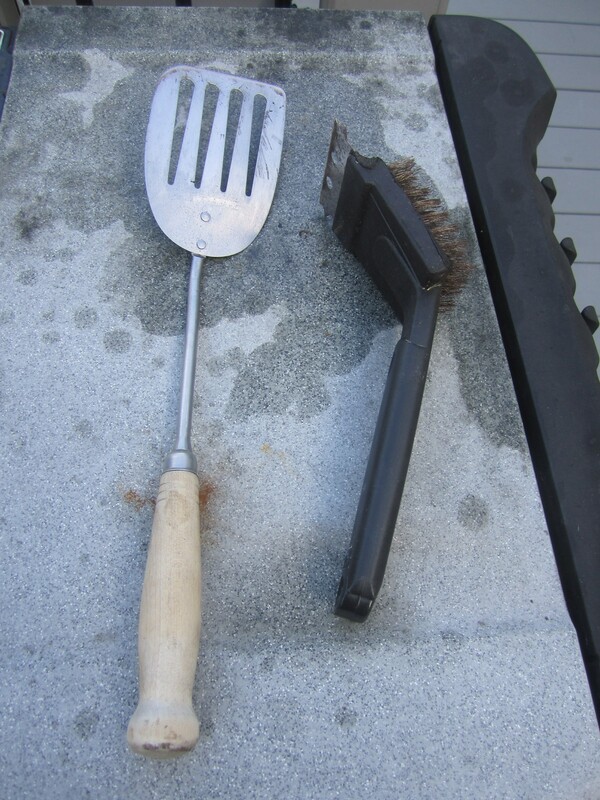 I use a long handled metal spatula for this job but anything will do including a paint scraper or even the scrape part of the grill brush. Put aside. 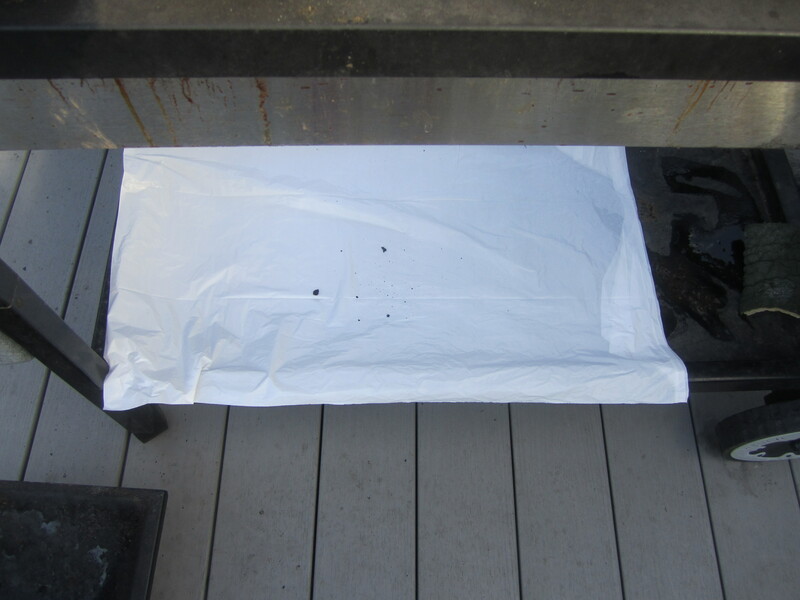 Take another plastic garbage bag and place under the grill (I happen to have a shelf on mine, so I place the bag on there). Scrape the insides of the grill as best you can and lightly scrape the inside of the hood. Throw out the plastic bag carefully (the black stuff gets away no matter how hard you try to contain it, so just accept). 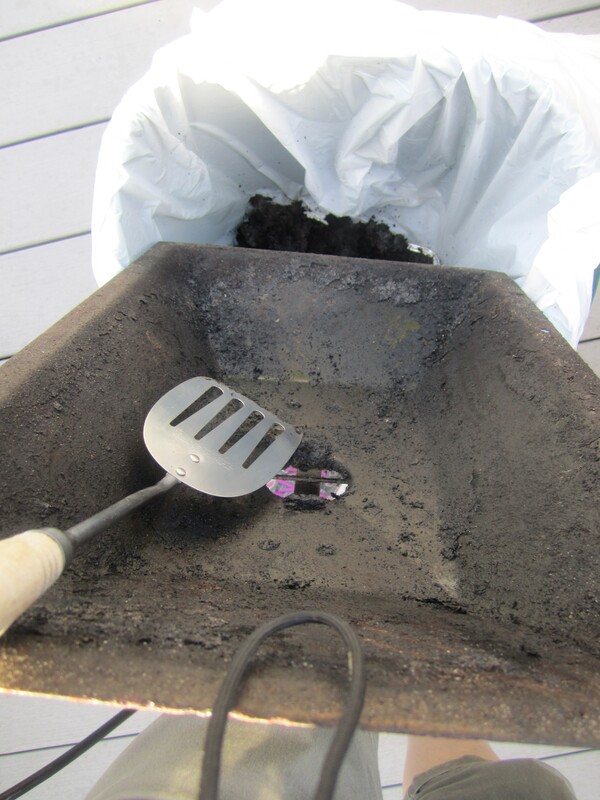 Scrape the bars of any residue gently, over the garbage can and replace inside the grill. Put the cooking grate(s) back in. 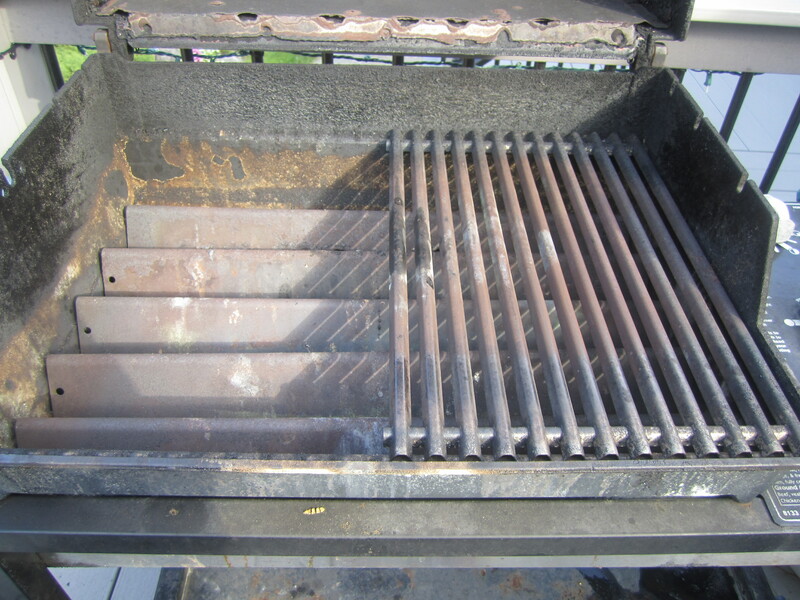 Replace tray under grill. 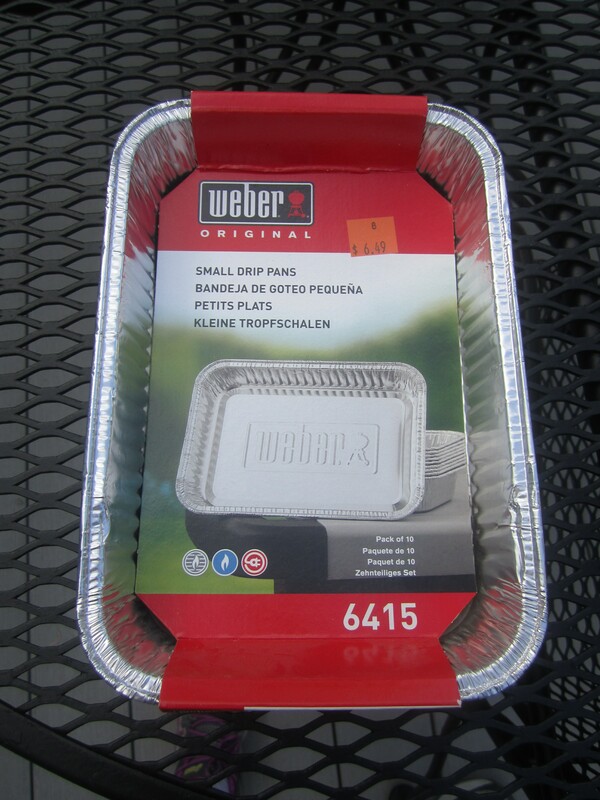 Take 2 disposable aluminum little pans and put them into the drip pan (one is not enough because it will leak). 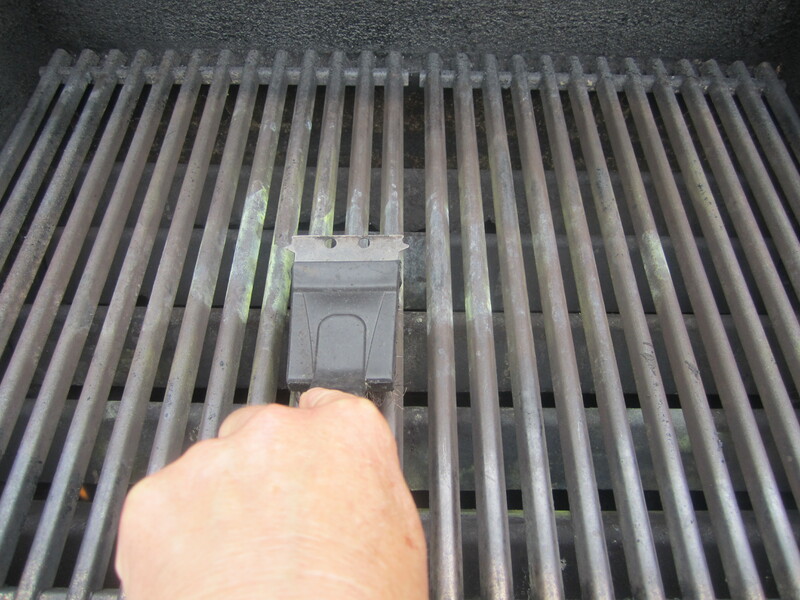 To clean the grate(s) the grill needs to be on. I usually do not do this until I am ready to cook but I will include it here and remind you again about cleaning the grates when it’s recipe time. 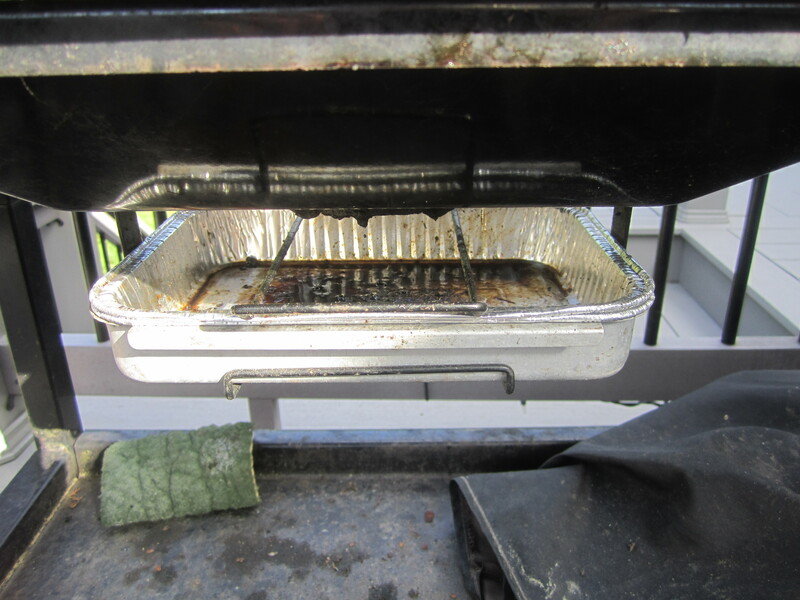 On my grill, this is the procedure: (but please read your manual FIRST!) 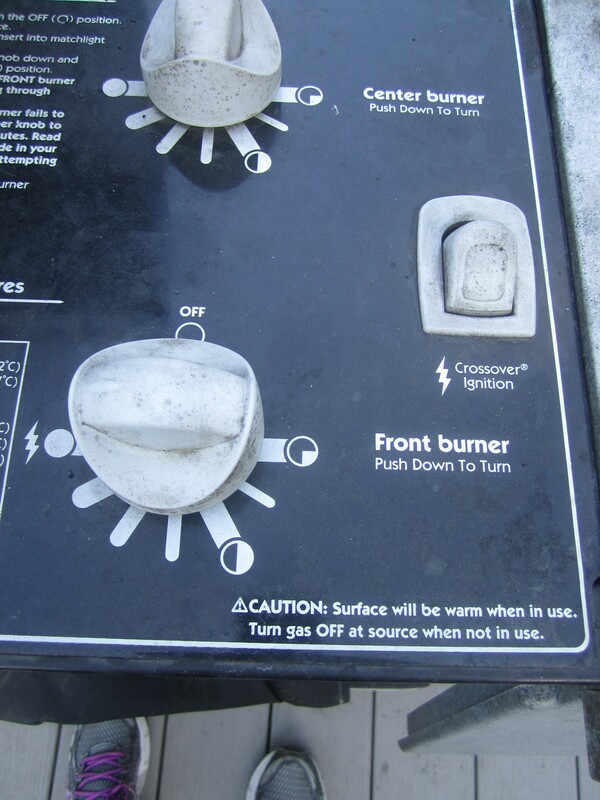 OPEN THE HOOD (If the propane tank is not open, open it), put the front burner knob on high and ignite with the push button ignition. You should hear it ignite. Then turn the other knob(s) on high as well. You should hear them ignite too. Once all the burner(s) have ignited and you can see the flame (there is also a little peep hole in the front of the grill, that when you look into, you can see the flames in the inside as well) close the hood and leave closed for 15 minutes. 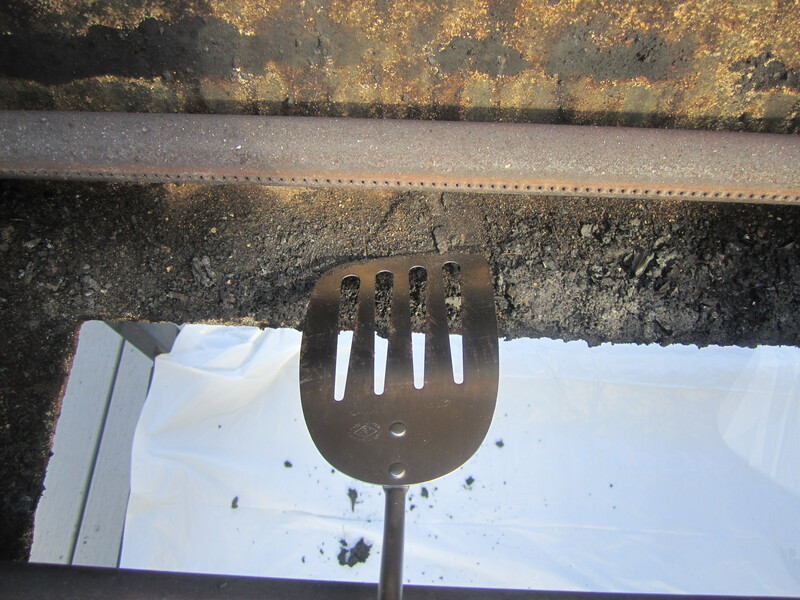 After 15 minutes open the hood and with your brush clean the grates thoroughly. Sometimes I use the scraper part on my grill as well, to get everything off. It’s very important that the grates be clean. 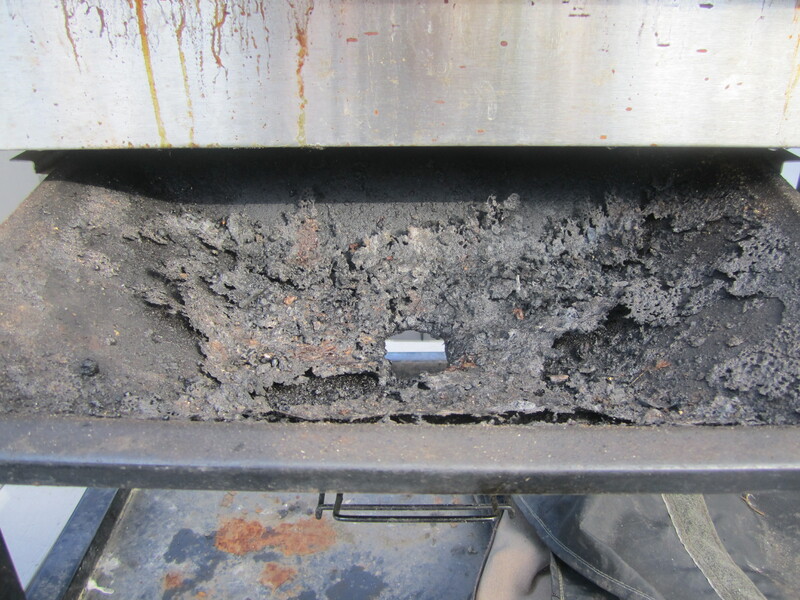 Your food could stick to the grate if they are not cleaned. You now have a pretty clean grill. Granted it’s not shiny beautiful but it’s clean enough to start grilling, which is the best part. So stay tuned! I will have a very basic grilling recipe next!